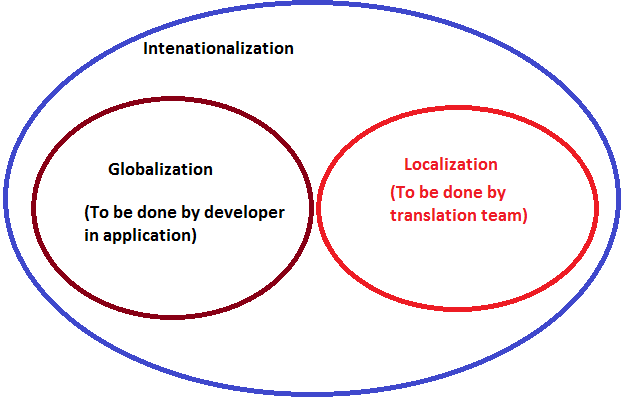 Localization is the process of translating an application’s resources into localized versions for each culture that the application will support. Translation of resource strings for specific culture/language that are supported by application. Culture specific localized images used in the application. It is the process of designing and developing a world-ready app that supports localized interfaces and regional data for users in multiple cultures. And this also means that application can handle things like date time formats, currency, string comparison and sorting etc. It is the process of localizing and globalizing application, and hence it is super-set of both. Declare AssemblyCulture attribute at assembly level for main assembly (by default this is added in the project by Visual Studio IDE). Declare NeutralResourcesLanguage attribute at assembly level to specify default culture of the assembly. This improves performance if resources are present in the assembly. All display strings (optionally images) presented to the user should come from Resources (i.e. from ResourceManger). Run Microsoft provided globalization code analysis rules, and resolve all warnings related to that. Also consider running these rules during build (by enabling these setting at project level) and treat these rules as errors instead of warnings. Use overloaded ToString method of numeric types that accepts ‘IFormatProvider’ object and pass on CultureInfo object (pass InvariantCulture to persist/serialize numeric values). Use TryParse method and pass InvariantCulture while de-serializing. For each form, set Localizable property of Windows Form to true. This auto generates form specific default resource file & uses ‘ComponentResourceManager’ to apply resources at runtime. A code sample will be added in part – 2 of this series. As a guideline keep enough space between UI controls so that culture specific text and images can be accommodated. The Resource File Generator (Resgen.exe) converts text (.txt or .restext) files and XML-based resource format (.resx) files to common language runtime binary (.resources) files that can be embedded in a runtime binary executable or satellite assembly. This is an alternative to Visual Studio IDE that just focuses on resource localization of Windows Forms. Winres.exe, is a visual layout tool that helps localization experts localize Windows Forms user interface (UI) resources used by forms. Winres.exe is the recommended tool to use if localization will be done by third-party localizers. Because Winres.exe is a localization tool only, it allows for a cleaner separation of an application’s code from the forms to be localized, which is more practical for managing large projects.